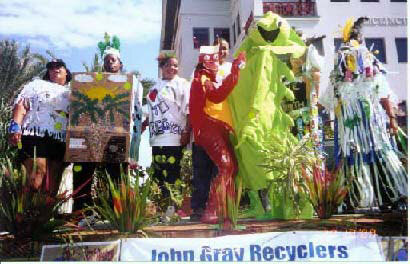 The John Gray Recyclers Recycling/Environmental Club was formed in September 1996 by concerned students from the John Gray High School, and our teacher Mrs Whitehead. They were active recyclers that cared about their environment. This club met initially once a week. The John Gray Recyclers' aim has been to promote active recycling in the Cayman Islands and to help keep the Cayman Islands the beautiful paradise that it is for ourselves and our visitors. We hope very much that we will be able to encourage everyone to take great care of the environment so that it does not become destroyed. Many coral reefs have/are being destroyed throughout the world and we want to unite with other children throughout the world to try and stop this terrible destruction. We have worked on various activites organised by the Department of Environmental Health and the Education Department. We have participated in Science Fairs and an Art Recycling Workshop held by an Artist from Maine. We had our artwork on display at the opening of the Cayman Islands' National Art Gallery. We have artwork currently on display in the classroom that we use for our recycling activities as well as our Science Fair projects. We had a recycling booth at the annual Agricultural Society Show in order to promote active recycling. We hold regular beach clean ups and regularly clean a beach in North Side that becomes polluted when north easterly/westerly winds bring garbage onshore. We found a vial on this beach that had been placed in the sea near Cuba as part of a pollution dispersal/marine life study by a United States marine research team. Since then we have been very interested in pollution dispersal due to ocean currents and the gulf stream, as well as other factors. When we do a beach clean up, we always check to see what type of garbage we have found and its origin. We hold Earth Day activities every year and also participate in the World Environment Day organised by the United Nations. The United Nations have signed our guest book. We have participated in four Pirates' Day Parades in succession, having won two second place and two third places. Two years in succession we have distributed 1,000 leaflets about active recycling. We have placed a question on the UK Overseas Territories Conservations A Breath of Fresh Air Forum about the littering of reefs and shores by marine dispersal of garbage. We have links to the Cayman Islands Department of Environment, the National Trust, and the Turtle Farm. We have been spotlighted in the Lead Stories page of the Cayman News 27 website. We were also spotlighted in the October 2002 edition of Whats Hot. Our theme for last year was Dont Spoil with Oil and we educated others of the importance of protecting our coral reefs and our environment through our website and our activities. As stated earlier we hope to get around the world with our website so that others can work with us as a team to stop the worlds coral reefs from being destroyed. 2003 - Thank you the Seacology Foundation for helping us to go around the world to help coral reefs and thank you for our Grand Cayman Environmental Park project! 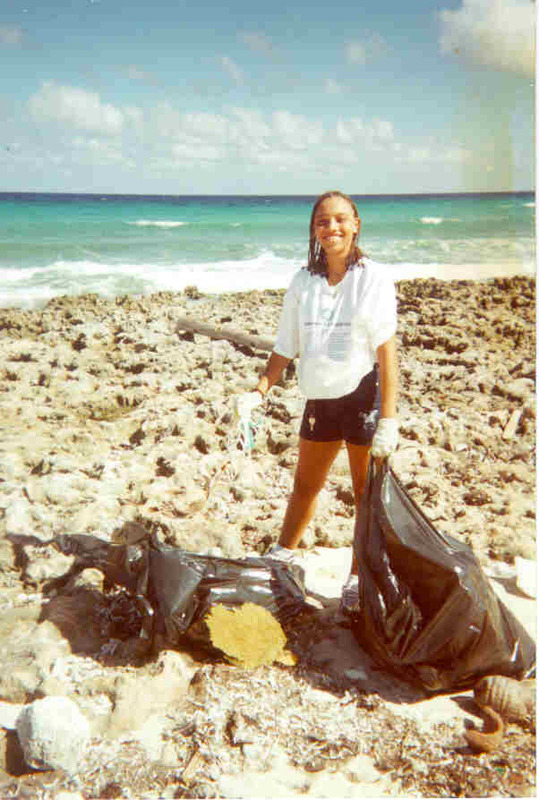 Priscilla "Grabbit" cleaning a beach of garbage at North Side. This beach becomes polluted by garbage due to north westerly/easterly winds that bring the garbage onto Cayman's shores from other parts of the world and the sea! 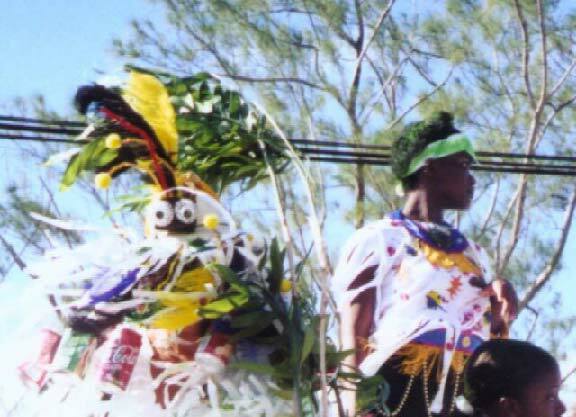 Pirates' Day Float Parade 2000 as described by the "Caymanian Compass"
"A libidinous iguana was one of the main attractions at this year's John Gray Recyclers float. The Iguana had the Pirates Week crowd roaring with laughter at his antics. A group of students from the John Gray High School recently worked alongside Department of Environmental Health staffers to put together a Pirates Week float which emphasised the importance of recycling. The group, known as the John Gray Recyclers, was founded in September 1996 by concerned students and their teacher, Mrs Christine Whitehead. 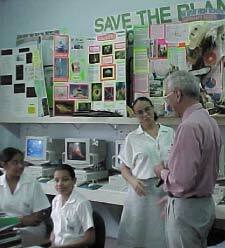 Since then, youngsters from the government high school have taken part in science fairs, beach clean-ups and workshops. However, their involvement with Pirates Week only started last year, when they won a second-place prize. 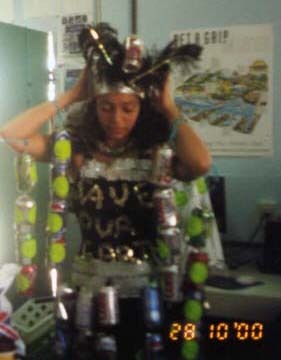 This year's entry picked up a third-place award, with a float theme, "Enjoy, Don't Destroy: Recycle." 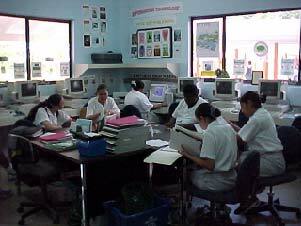 More than 21 students took part in the effort. The team is already looking forward to next year and wants to promote even more active recycling in the Cayman Islands, according to Mrs Whitehead. 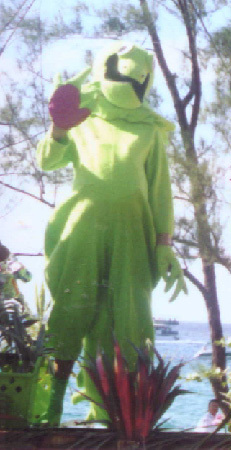 (GIS)"
We first created Reefy as part of our exhibition in the Science Fair in February 1998.